Due to my work still being cRaZy, 65-70hrs week, I didnt know if I would be able to hunt or not this year. Last year I drew the tag and couldnt get the time off to hunt so I turned the tag back in and got my points back. This year I decided to give it a try on the weekends and possibly sneek off and hunt a morning or two before work. Anywho, opening morning Saturday was TERRIBLE. TONS of guys surounding the roost trees, people chasing birds jump shooting them on the wing etc etc, crazy. Add on top of that we are stll having heavy snow. This morning I had a new strategy, Sleep in. Let the morons do their thing and then head up after they give up :D. So we slept in then went for a drive and found some birds around 11:30 this morning through the spotting scope about a mile away on a STEEP nasty ridge. My wife dropped me off on a higher ridge 1 canyon over. I worked my way down a treacherous slippery and steep slope and back up the other side in about 8" of snow. As I was about to crest the ridge, approx 200 yards from where i estimated the birds to be, I was surprised by a Tom sneaking through the sagebrush 30 yards ahead of me. I quickly threw up my gun, and got a shot off. Being surprised and way out of breath I shot just behind him. The next shot put the hurt on him but he wasnt giving up yet, He got in the air and went out of sight just ahead of me. I rushed up over the hill to find him standing maybe 30 yards from where I had hit him. He was on his feet (barely) but I could tell he was hit good as he was pretty shakey. I took careful aim and he dropped at the shot. 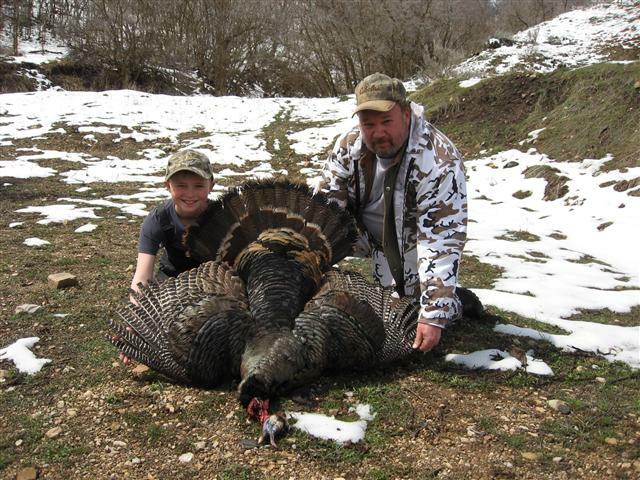 Nice Tom, not a bruiser but still a great bird. 9" beard on him. This was my first ever Turkey. The funny part to this story is I got the bird and headed directly down the mountain to the nearest road. Wife and boy picked me up and we went home. A few minutes later 2 police cars showed up. Some idiot called the police saying I had shot a turkey right off the road. The cops were really cool and totally pro-hunting. After I told where I hunted and where I shot the bird at, they called up the "idiot" back who then admitted they hadnt actually seen me shoot there, they just saw me with the bird getting into my truck and assumed I had shot it right then . The cops told me dont sweat it, it was perfectly legal when and where I killed it. They then congratulated me on it and went on asking me lots of questions about hunting and other things. The female officer asked if she could pick it up and hold it which I did LOL. Pretty cool cops. Fairly amusing... I'm glad I got one, but now I gotta figure out how to get one for my wife. I'll try and post a picture later. Well done Dallan...guess I know what you had for tea last night mate. A turkey for SWMBO should be fairly easy now you know the ridge where they roost...just keep a weather eye out for the nutcases who are hell bent on getting something regardless of safety or commonsense. Punkin...we have the same problem with kangaroos on our range...both ranges actually...the rifle range and the shotgun range. They know they are safe. Really!?!? That's have the hunting time available for a lot of us. Isn't there a club rule that doesn't allow any shooter to endanger any critter on the property? Eeee-Haawww...And the hunt is on. I know gobbler hunting is old hat for alot of you eastern guys. Out here however they are relatively new. We never had them growing up and its only been through extensive transplanting that bird populations are increasing. My wife still has a tag as well, she will get to hunt during the days for the next 2 weeks. With that much time she should be able to stumble into something (I had her within 20 yards of 10 hens yesterday but no toms / jakes were with the hens). Our season starts May 1st. I can't wait to get out there! NICE job, Dallan. The turkeys here have been making a fool of me the last two seasons. Same problem as Punkin - they only seem to come around on Sundays (no hunting here either). Congratulation on the thunder chicken. That boy's smile is as big as the bird is. Cheers and thank for the picture. and story. Actually I don't think there is a club rule about hunting/shooting critters but as far as I know no one does on club property. I've seen a number of turkeys crossing the range at different times and everyone just waits for them to move on. There are deer tracks there too but I've never seen them when folks were shooting. Congratulations on your first bird Dallan. The only time I've seen turkeys "on the hoof" so to speak, has been when I've had an elk tag & a .300WSM up in Colorado - had them walk past within 5yds of where I was laid up. jeh7mmmag, I've been to the Lex several times! T-2s, A-4s, A-7s, Boy Scout "camp" over in her new Corpus Cristi home. LSO kept ragging on me for landing on 16 Left! When were you aboard?